Chapter 1 : Why Mars?. Chapter 2 : The Cart Before the Horse: Mariner Spacecraft and Launch Vehicles. Evolution of Unmanned Space Exploration to 1960. Chapter 3 : The Search for Martian Life Begins: 1959-1965. The Rise of Exobiology as a Discipline. The Results of Mariner 4. Chapter 4 : Voyager: Perils of Advanced Planning, 1960-1967. Chapter 5 : Reorganization and the Creation of Viking. Langley Enters the Mars Business. Chapter 6 : Viking Orbiter and Its Mariner Inheritance. First Phase of Viking Orbiter Planning. Viking Mission Definition No. 2. Chapter 7 : Viking Lander: Creating The Science Teams. Chapter 8 : Viking Lander: Building A Complex Spacecraft. Chapter 9 : Safe Havens: Selecting Landing Sites for Viking. Financial Problems Threaten Orbital Imaging System. Chapter 10 : Site Certification - and Landing. Chapter 11 : On Mars. 1. Milestones of the Recommended U.S. Spaceflight Program, July 1958. 2. Proposed Lunar and Deep Space Program, 1958. 3. JPL-Proposed Lunar and Planetary Missions, 12 January 1959. 4. Influences on the Ten-Year Plan, 1960. 5. Centaur Launch Schedule as Modified in January 1961. 6. Physical Properties, Mars and Earth (1964). 7. Ames Life-Detection Team Evaluation of Proposed Biology Instruments- Development Status, 1963. 8. Physical Properties of Mars: Mariner 4 Findings. 9. Highlights of Advanced Planetary Spacecraft Group Investigations 1962. 10. Ranking of Contractors Bidding on 1963 Voyager Study. 11. AVCO Proposals for Missions to Mars, 1963. 12. Voyager System Weights from 1963 Contractor Studies. 13. Experiments Recommended for Voyager 1969 in 1963 Contractor Studies. 14. NASA Budget Summary, Fiscal 1963 to 1966. 16. NASA Fiscal 1968 Budget. 17. Final NASA Budget, Fiscal 1968. 18. Sample Areas of Scientific Interest. 19. Specific Objectives of an Early Mars Orbiter Probe. 20. Post-Voyager Proposals for Planetary Exploration Projects. 21. Estimated Costs for Mars Program, January 1968. 22. 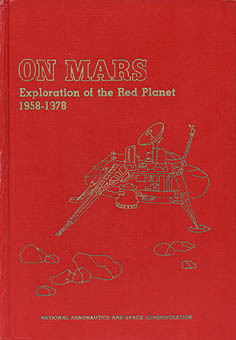 Mars Program, January 1968. 23. Lunar and Planetary Exploration Budget Plan, FY 1969. 24. 20 Alternative Mission Modes Examined for Viking 73. 25. Viking Mission Modes Examined at 8-9 November 1968 Briefing. 26. Sources of Viking Orbiter Subsystems. 27. Mariner 69 and 71 Spacecraft Comparisons. 28. Major Test and Flight Hardware to be Developed by JPL for the Viking Orbiter. 29. Pictures from Mariner Mars 69. 30. Viking Project Orbiter System: Critical Schedule Activities, 1969. 31. Viking Project Orbiter System: Baseline Conceptual Design Changes, Expected Weights, 1969. 34. Growth in Capacity of Data Storage Subsystems. 35. Viking Orbiter Specifications, 1969-l975. 37. Key Dates in Assessment of Viking Science Proposals. 38. Estimates for Lander Payload, September 1969. 39. Viking Science Cost Projections, September 1969. 40. Alternatives for 1975 Viking Launch. 41. Viking Cost Increases Because of Launch Delay. 42. Viking Biology Instrument Schedule, 1971-1975. 43. Cost History of Viking Lander and Selected Subsystems. 45. Mars Surface Thermal Simulation. 46. Viking Cost Projections, 1974. 47. Viking Demonstration and Training Tests. 48. Candidate Landing Sites Selected, August 1972. 49. Changes in Candidate Landing Sites, October 1972. 50. Polar landing Sites Proposed December 1972. 51. Major Training Tests for Planetary Operations. 52. Geological Evolution of Martian North Polar Region. 53. Structure of Martian Atmosphere. 54. Mars and Earth Temperatures, 21 July 1976. 55. Viking Radio Science Investigations.